Durable, comfortable and most importantly fashionable, Gersemi is changing the way women look at equestiran clothing. Durable, comfortable and most importantly fashionable, Gersemi is changing the way women look at equestrian clothing. With twice yearly collections (a spring/summer collection driven by the sport and an autumn/winter collection that is more serious and functional), Maricela Alexandersson, along with her husband Jan, are combining quality fabrics with a luxurious feel to create a beautiful line of clothing for every woman. SLHL: How did Gersemi come about, and what has your involvement been? Maricela: My husband Jan Alexandersson started the company over 30 years ago as an equestrian wholesale company. After 10 years, he decided to focus only on equestrian apparel with a brand he built known as Kyra K. In 2009, he decided to launch a new brand, Gersemi, with its heritage from Scandinavian mythology. Gersemi represents beauty and treasure. I got involved in the design process in 2010, and I completely took over the designing for Gersemi with the Spring 2011 collection. SLHL: While your clothes are geared towards equestrians, can your pieces be worn by anyone? Maricela: Yes! I brought a completely different approach to what Gersemi had been offering in the past. The brand has crossed over more into fashion. I see equestrian clothes as something that can easily be worn outside the barn. I wanted the Gersemi girl to feel fashionable as well as comfortable in her clothes. SLHL: What makes your line unique to other leisurewear lines? Maricela: The large array of detail that goes in to the designing of the brand is palpable when our customers spend almost as much time admiring the inside of the garments as they do the outside. To me, that is a true measure of our success. From the velvet ribbon applied to our neck seams, to the luxurious lining fabrics, the soft lining on pockets and the cell phone pockets on most of our jackets, these are all details that I feel are neglected in today’s mass produced fashion. SLHL: How do you mix fashion with functionality? 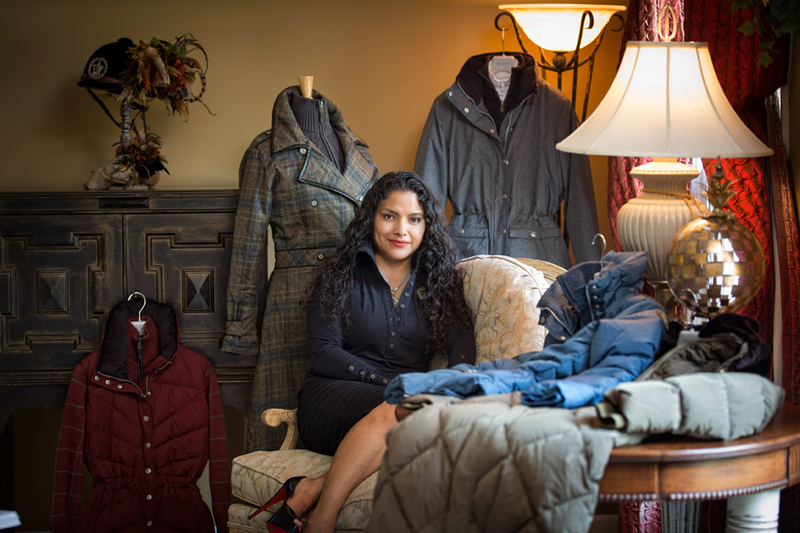 Maricela: My husband’s expertise in how fabric performance affects the purpose of the garment with my need for luxurious feeling fabrics creates a line of clothing that is not only fashionable, but also performs in the harshest of weather conditions. When we label an item waterproof, it means that each seam is carefully taped on the inside to prevent leakage through the seams. For us, it is important that the clothes we put on the market are not only fashionable, but also durable, comfortable, functional and with great ease of care. All of our products are machine washable. SLHL: What is new in your autumn/winter collection for 2013? Maricela: Our autumn/winter collection is currently in stores. You will find an Old English-inspired line with gorgeous plaid fabrics that mix beautifully with tweeds in muted tones of moss, Bordeaux, blue stone and graphite. Imagine steam engines in an old English train station. One of my favorite pieces is the Isabella double-breasted long coat. It has oversized buttons and faux leather trim throughout. The backside is very unique in that it has three separate panels. Two of them come together at the center with a third one right at the center allowing for maximum ease of movement.